It is a testament to the community that Warrenville has many historic buildings still standing. Many of these historic structures were built during the early and mid 1800s as Warrenville was being settled. Thanks to the Warren Tavern Preservationists, the Warren Tavern has been preserved, although it no longer stands where Colonel Julius Warren constructed it as the town’s stagecoach stop in 1838. Colonel Warren opened his Tavern with a grand ball on September 28, 1838. Over the next 174 years the building served many purposes including the home of the DuPage County Democratic Convention in 1839, a hotel, a dance hall and a private home. 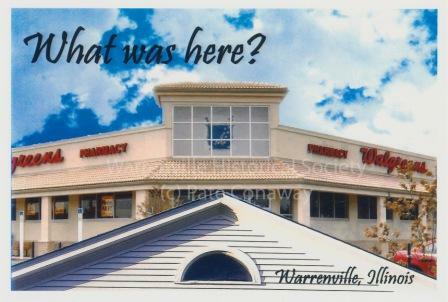 In 1989 a new owner started planning the destruction of the building, however a group of concerned citizens formed the Warren Tavern Preservationists and moved the Tavern from the northwest corner of Warrenville Road and Winfield Road, to its current home at 3S540 Second Street next to the museum in Leone Schmidt Heritage Park. The Tavern is safely located in this historic park, while Walgreens now sits on the Tavern’s former home. 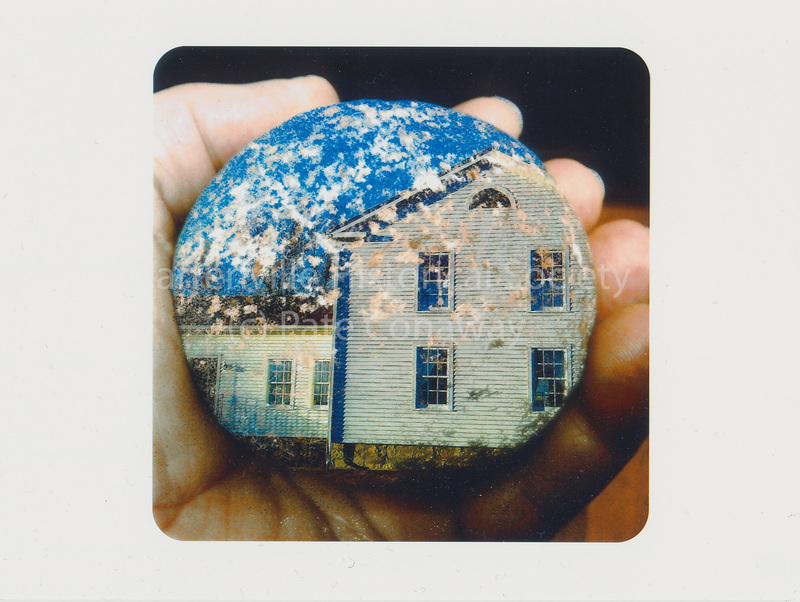 Warrenville Inspired artist Paté Conaway played on this and other local histories in his work that used Warrenville’s images to question the notions of place and how people change landscapes. We hope you will enjoy seeing Paté’s creations inspired by the history of the Tavern and the shifting of Warrenville’s landscape. “One of the ways I find inspiration for my work is to go into institutions – specifically nursing homes –and have the residents show me how to do things. There are many creative retired individuals that are open and willing to share their knowledge and skills. I have learned knitting, crocheting, embroidery, woodworking, and sewing. I see these crafts as languages, and my job as an artist is to explore the translations. One of the questions that I like to ask is: where is the line between craft and art? The Museum is open today from 4-7pm and Sunday from 1-4pm for the last open days of Warrenville Inspired. Please enjoy learning a little bit about one of our featured artists Jessica Bruah and then stop by the Museum to see the show before it closes! 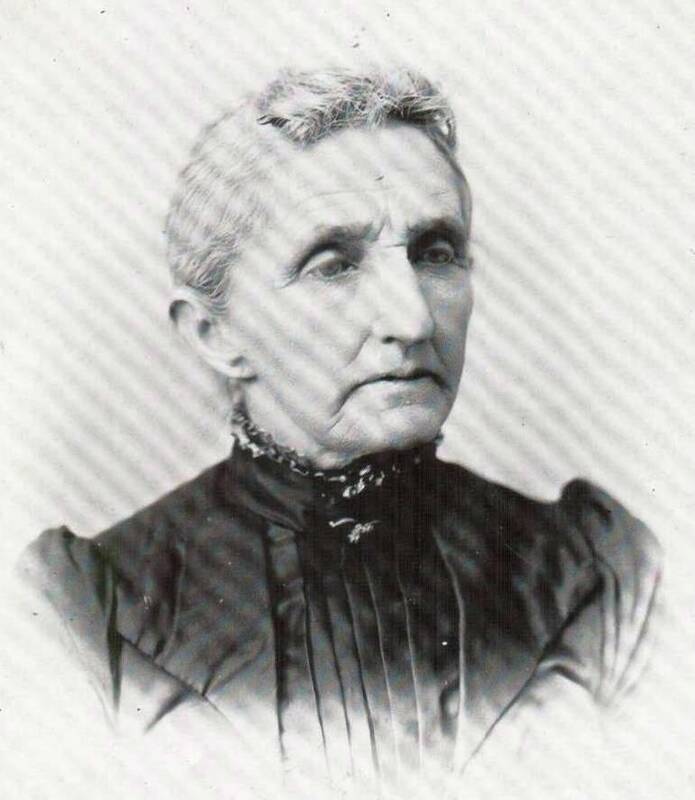 Jessica used Clara Wilson Albright, Adam Albright’s wife, as inspiration for her piece. Jessica Bruah’s recent work revolves around the surreal and layered identities of specific tourist areas. She received her Master of Fine Arts from the School of Visual Arts in 2009 and her Bachelor of Fine Arts from Columbia College Chicago in 2004. She has exhibited work bothnationally and internationally, including shows at Jen Bekman Gallery in New York City, Catherine Edelman Gallery in Chicago, and Photo-Eye Gallery in Santa Fe. In 2010, Bruah was awarded a Swing Space artist residency through the Lower Manhattan Cultural Council. She also had two solo exhibitions in the past year: one in the fall of 2010 at Georgia College Museum for her project Stories, and one in the spring of 2011 at ACRE Projects in Chicago. In the fall of 2012 she will be a resident artist at the Vermont Studio Center. Learn more about Jessica by vising her websites http://www.jessicabruah.com and jessicabruah.tumblr.com. Warrenville Inspired closes this Sunday. We hope you enjoy reading a little bit about one of other featured artists, Andrew CopperSmith, a Glen Ellyn native, and then stop by the museum to see the exhibit before it closes. A big congratulations to Andrew as well, as he finishes his Master of Fine Arts this spring from The School of the Art Institute of Chicago. His work will be featured in the MFA 2012 Graduation Show that opens this Friday (http://blogs.saic.edu/gradexhibition2012/). See more about Andrew’s work at his website http://www.andrewcoppersmith.com. “I am curious about everyday forms and materials and the given spaces and environments that bring them contextual meaning. Through my sculptural practice I investigate the potential of recontextualizing these forms and materials to question the perception of what constitutes the ordinary and mundane aspects of the everyday. Through this investigation of daily perception, I utilize conceptual strategies of abstraction and narrative non sequitur to develop my intentions within my working process. With examining the familiar and often overlooked aspects of our physical surroundings, I am provoked to create work that highlights the poetic sensibility of the common and usual. There are only two more days to see Warrenville Inspired, Thursday, April 26th from 4-7pm and Sunday, April 29th from 1-4pm. We hope you enjoy learning a little more about one of the featured artists Jason Judd, and then stop by the Museum before this exhibit closes. Jason is currently pursuing his Master of Fine Arts in Time Arts and Museum Studies at Northern Illinois University. As a graduate instructor for the NIU Time Arts program, Jason teaches Introduction to Video Art and Critical Topics in Art and Time. Find out more about his work at http://www.jasonajudd.com. 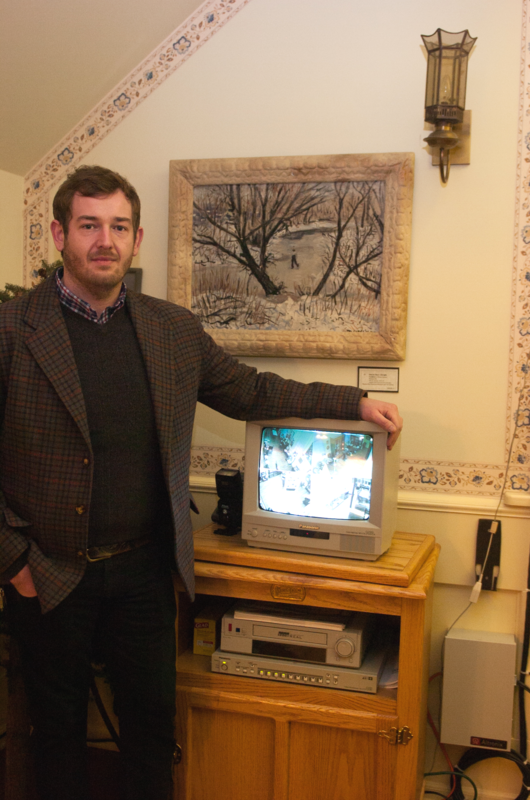 Jason was inspired by viewing our galleries through the museum’s security camera monitor. Jason next to the museum's security camera monitor.